This is a really basic easy recipe when you're looking for something to have with a cup of coffee or tea. Use any kind of fruit, especially berries for this one. 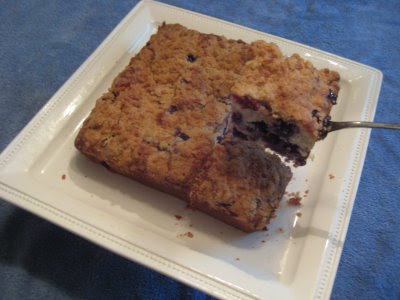 I think a raspberry buckle sounds heavenly, don't you? Then again, my brother Chris suggested that I should use Huckleberries, making it , yes, you guessed it, say it with me......a Huckle Buckle. Cream butter and sugar until fluffy. Add egg and beat well. Then add sifted dry ingredients alternately with milk, beating until smooth. Gently fold in berries. Combine crumb topping ingredients. Sprinkle over batter. Bake in greased 9 x 9 x 2 at 375 degrees for about 35 minutes. This recipe only makes a small cake, which is perfect if you don't have a big crowd, but if you'd like a larger cake, you can easily double it and bake it in a 9x13 pan.